Remove husk from corn cobs. Brush each cob with butter (or you may prefer to spray with canola oil). Place corn directly over heat of grill pan or on Rotate when dark spots appear (usually about 2-3 minutes) until the cobs are cooked – approximately 10-12 minutes. The cob will be speckled with char spots when cooked. Allow to cool then remove corn kernels from cob with a knife. Place into a large bowl. Add all other ingredients into bowl, including lime juice, then stir to combine. Cover and chill for 10 minutes to infuse flavours. 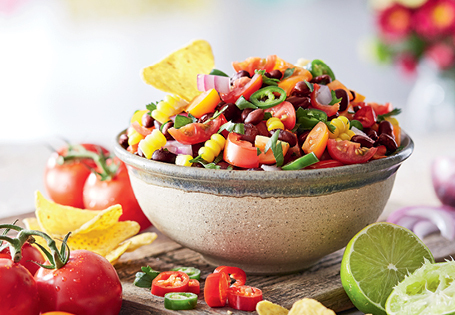 Serve with your favourite corn chips. It’s the perfect addition to your Mexican food night!